2 December #GivingTuesday is a day dedicated to giving back. On this day, charities, families, and businesses around the world unite for a common purpose: to celebrate generosity and to give. Are you on the mailing list for multiple charities? 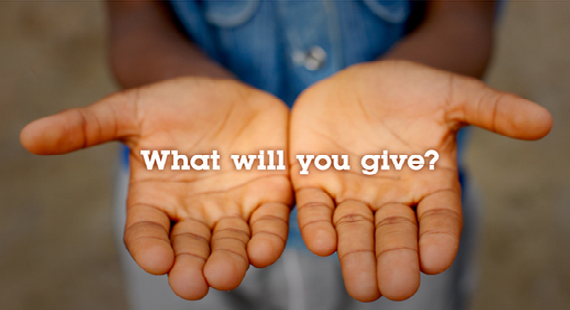 How do you decide on the best use of your charitable dollars? In Part 2 of a series on donation discernment, Gerardine Luongo discusses what to consider when evaluating a charity’s programs. Once you’ve determined that the non-profit is fiscally sound it is time to be sure that the organization is doing what it says it’s doing. With this step you will be asking for data on the why, what and how of program services and strategies. Again, most of this should be available on the website. Why are they doing what they are doing? This may seem obvious but it’s worth asking the question. Can the organization provide documentation on why they do what they do? IS IT NEEDED? Is the service needed in that particular community? While most people agree that it is important to provide services to the homeless for example, it is equally important for the organization to demonstrate that those services are needed in the target community. How do they know how many people are homeless in their neighborhood? How do they know how many women need ante-natal care in a region in Kenya? Solid non-profits will not only rely on data collected by large institutions such as the WHO or governments, but will do some of their own research as to what is needed in a particular neighborhood, community, or region of the world. HERE IS A BIG CLUE THAT THE ORGANIZATION IS INDEED RESPONDING TO A VALID NEED: They asked those they serve! Providing food for the hungry is a noble and much needed service in communities the world over. But is it the service most needed in that particular community? If asked, would those in line for the meal prioritize getting the meal or would they say they need transport such as bus tickets so they can get better jobs? (This is just an example; I am in no way minimizing the tremendous value of soup kitchens and meal programs). What is important is that the organization provide opportunities for clients to have input into what services are needed and how those services should be delivered. Evidence of this approach includes conducting client surveys, having clients serve on committees or even on the Board, or simply engaging clients in an ongoing dialogue about what is needed and how best to meet those needs. What-does the organization clearly indicate its mission and goals? This is an important yet often overlooked area of due diligence. It’s important to have a clear understanding about what the organization is trying to achieve and how it measures success. Vision, mission, and goal statements should be clearly present on the webpage. 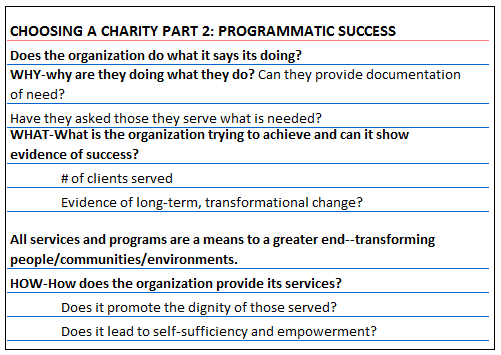 Increasingly, funders such as governments and large philanthropic organizations require solid evidence of programmatic success. To do this organizations must develop metrics that demonstrate program outcomes. At a minimum, an organization should be able to provide detailed information on outputs. Outputs include: the number of teens who graduate high school, meals served, shelter beds used, counseling sessions and the like. This data is helpful to demonstrate the output of an organization but not always the outcome or true impact of services. Moving from outputs to outcomes, non-profits are now being asked to answer what I call the so-what question. As an example, for programs designed to help teens graduate high school, I would frame the so-what question something like this: so what if a teen graduates high-school if that success doesn’t lead to sustained change (goes on to college or goes to work but is better able to advance in the job than someone who didn’t graduate)? In other words, HS graduation is a means to a greater end. So what if an organization provided after-school enrichment programs to 10 children but there is no evidence that those children are better able to read or demonstrate proficiency in other areas than their peers who did not participate in the program? The so what goes beyond just the numbers of how many people served. These are very tough questions to answer and ones you may not think the non-profit should have to answer. The logic is that providing meals to the hungry is a good thing (indeed it is! ); helping students graduate high school is a good thing (and again, indeed it is) but are those services sufficient to transform lives and if transformation isn’t the goal, shouldn’t it be? Here’s another example: I managed some projects at nursing schools in Africa and Haiti. It was sufficient at one time to say that X number of students graduated each year. These countries desperately needed well-trained healthcare professionals and nurses are key frontline health workers. So it followed that more graduates equaled more nurses and more nurses equaled improved health within a community. But while the research indicates nurses are game-changers in terms of healthcare in developing countries, it didn’t necessarily follow that our graduates were the game-changers in our specific communities and countries (in fact they were/are but the organization had to a conduct a deeper evaluation to demonstrate that success). Showing impact or sustained change requires effort. In the case of the nursing schools, the organization had to go beyond graduation numbers and begin to ask questions such as: are those graduates employed as nurses one, two, three years post-graduation? Have they stayed in their countries or did they emigrate from Haiti to the US? Are they training other nurses? How many patients do they care for and in what communities? In other words, has their education led to transformational change? Good non-profits are doing what they do to transform lives/communities/environments, not just provide a service. Keep in mind that good non-profits may partner and collaborate with other organizations to ensure that sustained change is possible. For example, the soup kitchen that partners with addiction programs or GED programs to ensure comprehensive services that lead to lasting change. The organization may not provide all the services need for transformation but should be working in collaboration with other programs in a community. Just another note: transformation takes a long time and demonstrating this level of impact may be beyond the reach of some organizations in the short-run but they should at least be asking the questions. HOW-How does the organization provide it services? This question has to do with the way the organization is choosing to deliver its services. The answer should always be that services are delivered in a manner that shows respect, promotes dignity and empowers clients to lead as independent a life as possible. One of the best examples of showing respect and promoting dignity comes from programs launched during the holiday season. Communities of faith often launch programs during the holidays to get gifts to families, especially children, and food to families in need so that they may have a holiday meal. In the past, well-intentioned people would show up on the door steps of “needy” families and deliver a box of food and gifts much to the joy of the children. The unintended message to the children however, was that their parents were incapable of providing them with that same joy. Think for a moment about seeing your child’s face on Christmas morning (or the holiday you celebrate). Now think about the feeling in your heart knowing that you brought that joy to your child. Many groups have embraced an alternative approach to getting the gifts to children. They collect the same gifts and toys but rather than simply distributing the gifts, they host a market where parents can purchase those gifts for their children at little cost. Parents are able to choose the best gifts for their children. The children experience the same joy but now parents can experience what so many parents experience this time of year: their own joy at knowing that they gave their children the glee that only comes this time of year. With the exception of Santa, those of us who give gifts to those in need should remain anonymous to the children. Another way that organizations promote the dignity of those they serve is in how they fundraise. In the past, many organizations working to help the poor would send out materials with photos of families and people living in extreme poverty—bloated stomachs, shanties that served as houses, adults living on the streets. These are true depictions of those in need. These are true images of the lives of more people who most of us even realize. They are also somewhat useful in tugging at our heartstrings and getting us to donate funds. But those images can also exploit those they intend to help and really just serve to make us feel guilty for a few minutes, just long enough to write a small check. As noted above, good non-profits are in the business of transforming lives and demonstrating that transformation is an approach to fundraising that promotes the dignity of those served as well as the success of the programs. So you might want to start looking for images of joy and positive change in the fundraising materials you receive. Does the organization do what it says its doing? WHY-why are they doing what they do? Can they provide documentation of need? Have they asked those they serve what is needed? WHAT-What is the organization trying to achieve and can it show evidence of success? Evidence of long-term, transformational change? All services and programs are a means to a greater end–transforming people/communities/environments. HOW-How does the organization provide its services? Does it promote the dignity of those served? Does it lead to self-sufficiency and empowerment? Today on “Giving Tuesday” you will receive many requests to give. We offer you blessings for wisdom in your decision-making as you seek to contribute to the greater good.